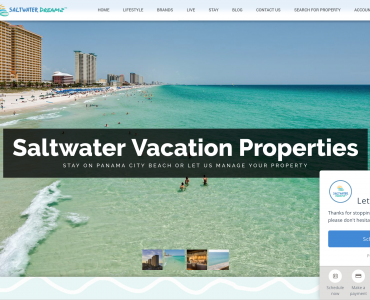 Saltwater Dreamz is the portal site for Saltwater Marketplace, Saltwater Real Estate, and Saltwater Vacation Properties in Panama City Beach, FL. 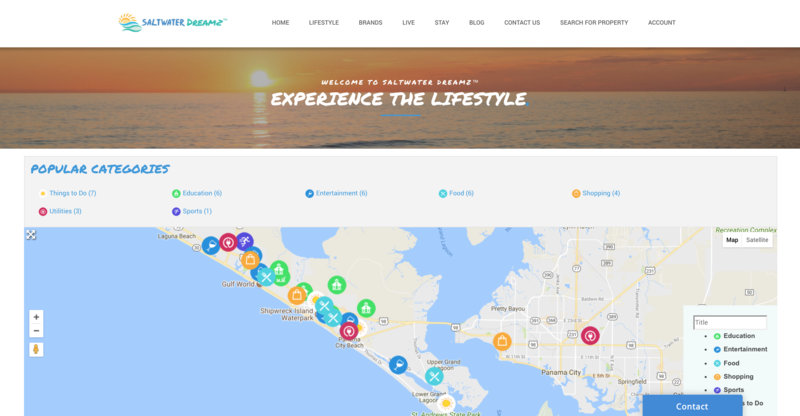 Saltwater Dreamz is a lifestyle brand in Panama City Beach, FL that consists of a Starbucks cafe and market complex on the Gulf of Mexico, a real estate sales team, and a property management group. We helped Saltwater Dreamz develop their branding consolidation strategy, the brand itself (including the name! ), imagery, and their web presence. Once the core elements of the project were in place, we developed their social media strategy and comprehensive-scope digital footprint. This included social media management, SEO, content creation, marketing automation, conversion optimization, and analytics. We even designed and implemented a local directory component for their website that allows for user submissions and reviews. SaltwaterDreamz is a umbrella-brand that engaged us to develop a master brand strategy that would optimize marketing ROI and simplify their growth model. The challenge was to develop a brand architecture to unite their three distinct business and serve as a cause-way to their real estate agency, property management company and retail storefront offering. 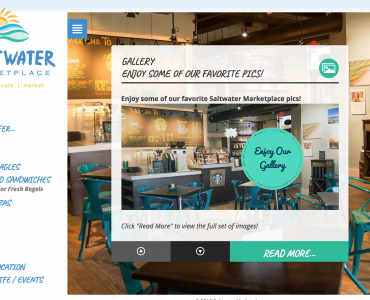 In late 2017, we designed their retail website, Saltwater Marketplace, and helped them to build and develop their facebook social strategy so, we were familiar with the customers business model and their brand style. In October ‘17, we began with a brand naming process. Multiple team meetings and several pads of post-it notes later, we eventually settled on an evocative, experiential name that worked in harmony with their established retail business and promoted the feeling/experience that the brand uses to engage it’s target audiences. SaltwaterDreamz became the brand-positioning identifier, encouraging “stickiness” across all of Saltwater Ent. unique set of service offerings. As a “hybrid” brand, development of a hybrid-logo and architecture model which served to protect the brand equity was essential to our success. 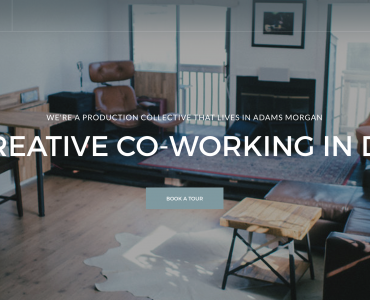 A working style guide was then developed for the SaltwaterDreamz team. A style guide is an essential process step for family-brands especially. Not only does the customer gain a better understanding of the branding and identity, but the brand then has the foundation to grow/expand in a way that is both sustainable and cohesive. As the business grows, so will the touch points of the brand. A cohesive, full-bodied style guide helps to inform and optimize the growth so that touch points have a similar tone, look and feel and align back to the “core ingredients” of the brand. This isn’t a rulebook by any means – there is always room for flexibility and trying something new. That being said, having a style guide as reference helps everyone to understand what works and what doesn’t. While style guides can tricky and often there are multiple versions, this is less of an indicator of the value of the document and can be more of an indication that people need to align to it in order to utilize it effectively. For optimal user-experience we started by defining the three circles of information architecture, that is, context, content and users. Using this strategy, we began the process of creating a website architecture that would allow first-time users to better understand and interact with the multiple-company entities in a way that would create impact, improve customer retention to drive flexible engagement in support of business goals. Understanding the SaltwaterDreamz buyer journey was critical to our wireframing and UX strategy. Creating user personas is all about establishing a touchpoint for content creation. For SaltwaterDreamz, we had several persona archetypes that we developed – using experiential knowledge, best guesses and qualitative and quantitative data. Following discovery, this researched was consolidated and analyzed and, ultimately fed into the development of user-interaction scenarios. Establishing persons not only allowed our team to answer the fundamental question, what problem is this platform solving? It also helped our website content writers to create copy that spoke directly to those users, in their natural language, and highlighted how SaltwaterDreamz works to adequately address those pain points. The user-personas we developed actively fed into the on-page content we created for SaltwaterDreamz. Competitive and market research combined with a strong keyword strategy helped to define our approach to content even more acutely. On the front-end, having an idea of what content will be featured on which pages helps to define the design layout and feeds into the sitemap architecture methodology. In order to develop a web platform for SaltwaterDreamz we set out on a journey of inspiration. We needed a design theme that would really speak to all the brands succinctly. 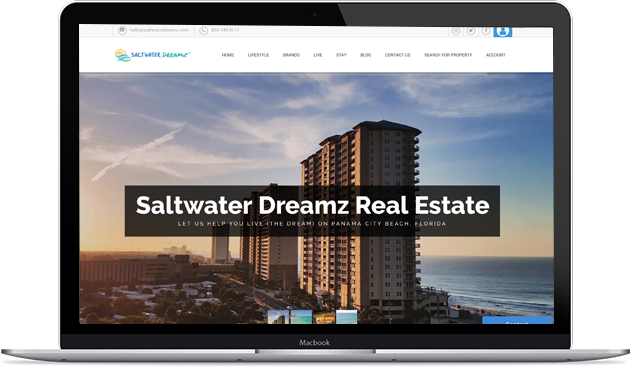 While we initially were procured to develop a universal brand platform for SaltwaterDreamz, our scope of work was later expanded to include a full real estate site with idx integration and an iframe pullover for rental property listings. Navigation was planned based on what tasks users of the website were most likely to want to achieve during their visit. In order to maximize conversion, we integrated behavioral targeted popups and scheduling tools to optimize user-engagement and encourage users to take action. Because of the complexity of the website platform integrations, creating web-content copy that allowed users to learn HOW to use the MLS search functionality was especially important. We developed the site in WordPress. WordPress is a powerful CMS that can be especially good for SEO and, with some tweaking, we were able to accomplish the goals initially outlined during discovery. Following user assurance testing, we had developed a rather robust and cohesive site with a seamless user experience. Harvard Business Review. (2018). Why Companies Are Advertising Their Master Brand. [online] Available at: https://hbr.org/2016/03/why-companies-are-advertising-their-master-brand [Accessed 14 Mar. 2018]. Miller, J. (2018). Brand Naming Process: How to Make a Brand Name Resonate. [online] Sticky Branding. Available at: https://stickybranding.com/brand-naming-process-how-to-make-a-brand-name-resonate/ [Accessed 14 Mar. 2018]. Vital Design. (2018). Brand Architecture Strategy: Building Brand Case Study. [online] Available at: https://vtldesign.com/brand-development/building-brand-value-why-you-need-a-brand-architecture-strategy/ [Accessed 14 Mar. 2018]. Morville, P. and Rosenfeld, L. (2006). Information architecture for the World Wide Web. Beijing: O’Reilly. CXL. (2018). 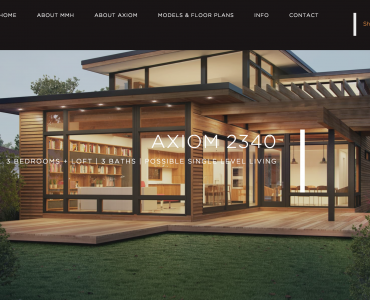 Getting The Website Information Architecture Right: How to Structure Your Site for Optimal User Experiences. [online] Available at: https://conversionxl.com/blog/website-information-architecture-optimal-user-experience/ [Accessed 14 Mar. 2018]. Forbes.com. (2018). Forbes Welcome. [online] Available at: https://www.forbes.com/sites/kylewong/2017/02/14/how-to-be-a-good-vendor-if-you-are-working-with-marketers/#7a40126b2086 [Accessed 15 Mar. 2018]. Social. (2018). The Beginner’s Guide to Creating Marketing Personas | Buffer. [online] Available at: https://blog.bufferapp.com/marketing-personas-beginners-guide [Accessed 15 Mar. 2018]. The Interaction Design Foundation. (2018). Personas – Why and How You Should Use Them. [online] Available at: https://www.interaction-design.org/literature/article/personas-why-and-how-you-should-use-them [Accessed 15 Mar. 2018].